For this Bingo Cake, I used one cake mix and an oval pan. Bake as directed and let cool completely. I iced in blue buttercream and made the bingo card out of gumpaste. I used pre-made candy numbers and letters in blue on the card. For the other numbers I used an edible marker. I used gum balls and wrote on them with the edible marker, to represent the bingo balls. I added a few gum paste flowers around the sides. Maybe we can meet! How cool! I only took course 2 and that was at Michael's a couple of yrs ago. Let me know if course 3 is worth the money. 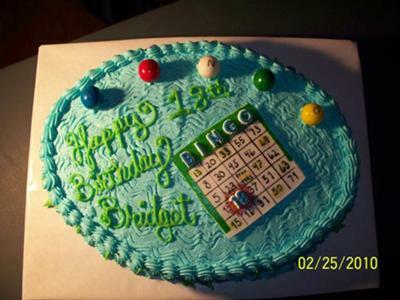 I loved your bingo cake. I too live in Van Buren AR. I am taking decorating classes at Hobby Lobby tonight starts the 3 course. Such a small world to be googling and see your cake.